You heard the scream. It's important to remember that. Sometimes, when it's late, and you hear something that sounds like a scream echoing through dark alleys, you try to convince yourself that it was something else. An animal. An illusion. Anything but what it sounded like. But it was a scream. You heard it, and you'll hear it again, because in the Sixth World, the supply of terror is growing. Bug spirits work to devour corporations from within. Shedim claim dead bodies and mobilize to their own dark ends. And the hidden corners of the metaplanes and the Matrix contain creatures that are best not imagined, because to imagine them is to sever ties with reason. 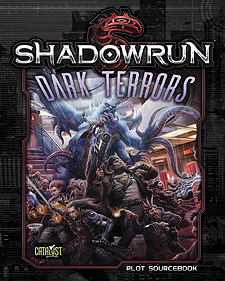 Dark Terrors is a catalogue of the horrors lurking under the surface of the Sixth World. With plot updates and hooks, critter stats, and campaign information presented in an immersive style, it's an invaluable resource for players ready to stay on the edge of their seats. It is for use with Shadowrun, Fifth Edition and Shadowrun: Anarchy.